Once a year, on 31 December, the world gets a glimpse into the workplace of Xi Jinping when the Chinese president broadcasts his New Year greeting from behind his desk in the Imperial City. Xi uses the opportunity to update his constituents on China’s achievements of the preceding 12 months and its goals for the upcoming year. Still, the annual address gets as much attention for the changes in the décor of Xi’s office as it does for his words. This past December, the media paid particularly close attention to two books on artificial intelligence on the bookshelf behind Xi’s desk — The Master Algorithm: How the Quest for the Ultimate Learning Machine Will Remake Our World by University of Washington computer science professor Pedro Domingos and Augmented: Life in the Smart Lane by Australian futurist Brett King. The recent additions to Xi’s library shouldn’t come as a surprise. Just two months earlier, during his keynote speech at the 19th National Congress of the Communist Party, Xi called for “deep integration between [China’s] real economy and advanced technologies including the internet, Big Data and artificial intelligence.” That pledge came on the heels of the July 2017 release by the State Council of its “New Generation Artificial Intelligence Plan,” a three-step development program to make China the world leader in artificial intelligence innovation by 2030, generating more than $150 billion in annual revenue from its core AI industry and more than $1.5 trillion from related industries. Which regions will gain the most from AI? China’s goals are ambitious, but the nation is well on the way to completing the first part of its plan: raising its overall artificial intelligence technology and applications to the most advanced level in the world by 2020. China came a distant second to the US in levels of AI investment as recently as 2016, according to McKinsey Global Institute. Last year, however, 48% of the total investment in AI startups globally went to Chinese ventures (up from 11% in 2016), versus 38% for US businesses, reports CB Research. China has also overtaken the US when it comes to registering AI patents, based on a search of titles and abstracts by CB Research using the keywords “artificial intelligence,” “deep learning” and “machine learning.” But China still has some ground to make up when it comes to basic research. Although academics at Chinese universities have published more papers on AI than those at US institutions for four out of the past five years, their work is less frequently cited than that of their western peers when self-citations are removed, according to SCImago Institutions Rankings. China’s AI efforts have been led by its private sector — specifically tech giants Baidu, Alibaba Group and Tencent. Baidu, China’s largest internet search provider, captured the market’s attention in 2014 when it hired Andrew Ng, cofounder of Google’s deep learning research team, to head its AI group. Last year, Baidu provided access to its AI technologies when it introduced an open-source software platform called Apollo, which it hopes will become the Android OS of the autonomous driving industry. Alibaba, which operates China’s largest e-commerce website, created an AI cloud platform called ET City Brain that can connect with various urban management systems, cameras and sensors in smart cities to improve public services, transportation and traffic conditions. Tencent, which has more than 1 billion people on its WeChat messaging, social media and payment platform, has been investing in medical startups around the world to bring healthcare AI technology to its users. China’s major wager on AI recognizes the critical role that intelligent machines and advanced robotics are playing in what Klaus Schwab, the founder and executive chairman of the World Economic Forum, described as the Fourth Industrial Revolution. The technological innovations at its heart - such as AI, the internet of things, 3D printing, autonomous vehicles, computer vision and genetic engineering — have the potential to boost incomes dramatically. 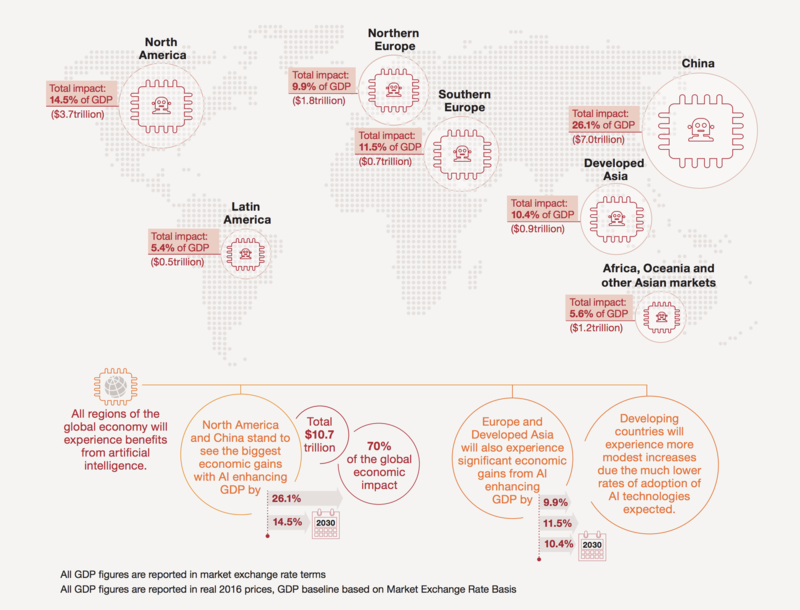 PwC estimates that AI alone could contribute as much as $15.7 trillion annually to the global economy in 2030. But unlike the first three industrial revolutions, the latest one is happening at an exponential pace — calling into question the very essence of what it means to be human, Schwab argues, as we wrestle with issues around ownership, privacy, relationships and work-life balance in an always-connected world. Innovation can also have a downside, of course, as evidenced by the labor dislocation, economic inequality and social tension that occurred during the first three industrial revolutions. In a recent interview with the BBC, Andy Haldane, chief economist at the Bank of England, warned that AI threatens to eliminate numerous jobs and leave people “technologically unemployed” as machines replace “both the cognitive and the technical skills of humans”. Artificial intelligence will lead to job losses - the occupations at risk include those that entail routine physical duties as well as those that involve a large amount of data collection and processing - but it will also create many new positions that require people to work closely with AI models. Thinking exponentially requires continually setting new goals. “It means thinking and acting with audacity, not complacency,” I write in my new book, The UnRules. “In an exponential world, what’s here today won’t be here tomorrow.” President Xi seems to understand that. Within days of his 2018 New Year address, Chinese authorities revealed that over the next five years the government will be spending $2.1 billion on a technology park in western Beijing dedicated to developing AI. The park is expected to house up to 400 companies, generating more than $7 billion in total annual revenue. Although that’s still well short of China’s audacious $150 billion target, it’s a good start.